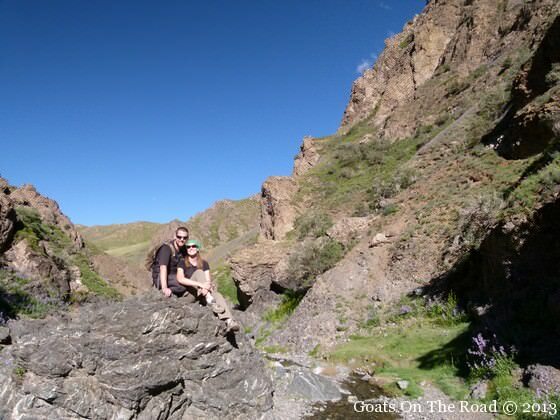 After spending a day in Ulan Bator, the capital city of Mongolia, we were ready to set off into the great outdoors and experience all that this awesome country has to offer. 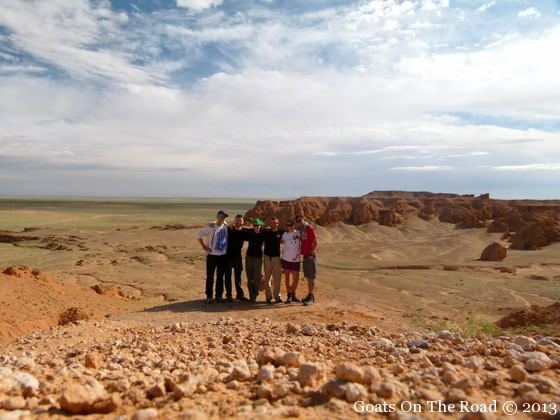 We met up with 4 other like-minded backpackers about the same age as us, and began planning our trip with them out into the Gobi Desert! As you know (or may not know), we are desert junkies. We can’t get enough of them. 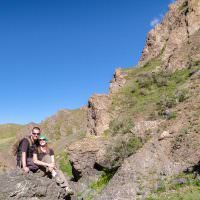 We’ve spent some time in the western deserts of Egypt and we did a camel safari in India, but we had yet to experience a desert so diverse as the Gobi. The 6 of us (Ben, James, Anna, Merlin and us) loaded our bags and bodies into the minivan and headed out into the great expanses of the desert with our guide and driver. 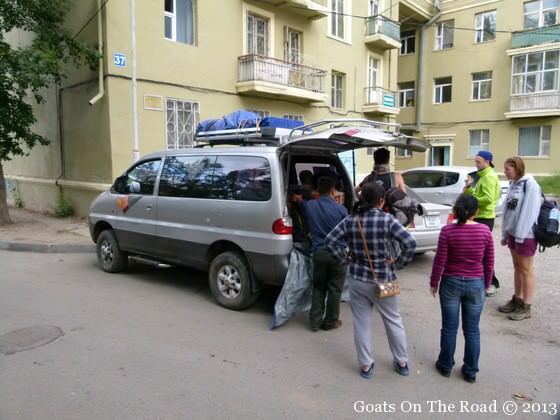 Loading up the van…Gobi Desert, here we come! We made our way through some horrendous traffic in the capital city and out into the open steppe. It only took about 15 minutes of being out of the city to see the rolling green hillside. We all bumped and bounced around to the tune of Mongolian music, complete with “neighing” horses as lyrics! We stopped in at a sum (very small town) and had our first taste of countryside food. From that point on, everything we ate would be made of either goat or sheep. We also got our first glance at the type of toilet we would be using for the next 6 days, and I think it’s safe to say that they were the worst we had ever seen! The driving time on the first day was pretty rough. 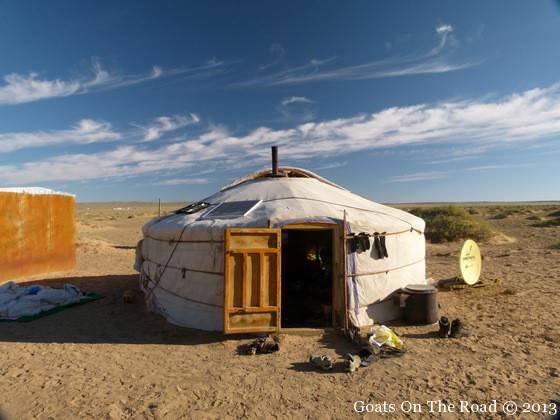 Because we wanted our trip to last 6 days instead of 7, we ended up driving for 13.5 hours before arriving at our ger (traditional Mongolian home, also called a yurt in some countries). The 6 of us got settled in, had some dinner and shots of vodka to kill any bacteria in our stomachs (which would become the norm during our travels here) while watching the sun set over the horizon. 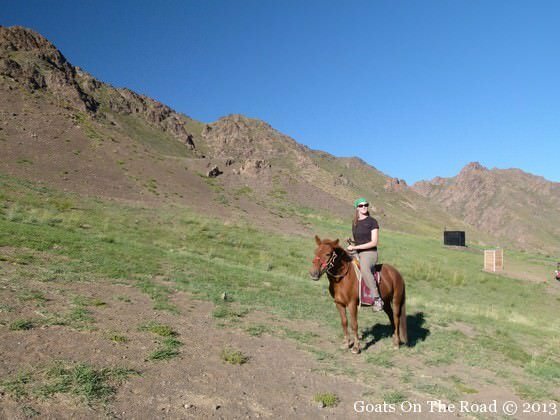 We awoke to “baahhh’ing” goats and sheep and peered our heads outside of our ger. We packed up everything, had some breakfast and before we knew it, we were on the road again. We started off by seeing the Flaming Cliffs, which are famous for being the very first place where dinosaur eggs were discovered. These steep cliffs were stunning and when the sun hit them just right, they definitely looked red and flaming. We continued on after a little while before coming to a herd of camels blocking the road! Our first desert camels of the trip. We got out and took some photos and Nick tried to pet one…with no success. Back in the van we went and continued making our way to our next ger camp. 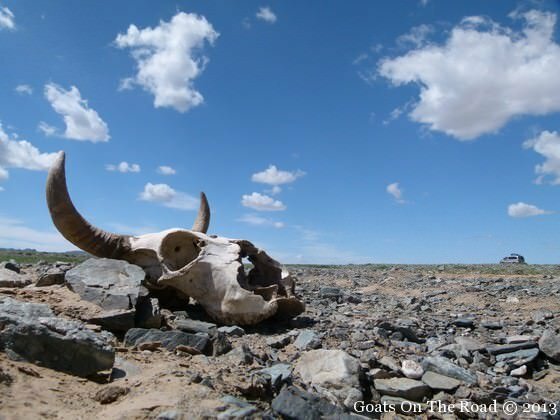 Before arriving at our final destination for the day, we found a cow skull. I don’t know if it was the sun that was making us a bit loopy or what, but we all decided that this dead animal head would become our mascot for the entire trip. We named it Gandalf and from then on, he was a part of our crew. 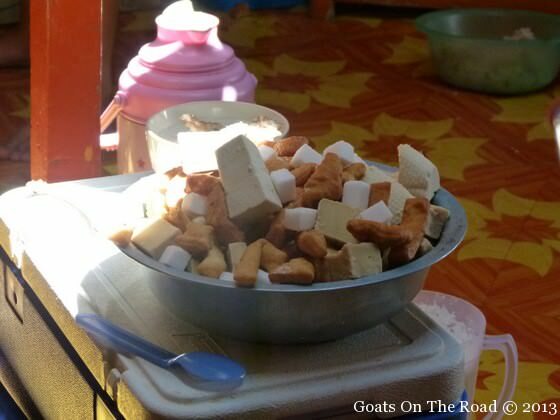 We arrived around 2:00 and were invited into the family’s ger for some local cheese, bread and milk tea. We all lounged around enjoying the desert life before mounting a camel and making our way to the massive sand dunes that loomed in the distance. We’ve seen huge sand dunes when we were travelling in the Great Sand Sea of Egypt, but these ones were completely different. We said goodbye to our ger, the camels, the goats and the sheep and set off on a 7 hour journey. We stopped at a stunning gorge for lunch and a bit of relaxation before getting back in the van and continuing on to the Yolyn Am, which is another gorge that is covered in 10 meters of ice for 10 months out of the year! The group of us decided that we wanted to rent horses and ride through the canyon rather than walking. Nick, Merlin and James took off in a fury and were galloping down the canyon, while me, Anna and Ben were stuck kicking our hopeless horses! No amount of kicking, whipping or “Choooo’ing” (as the locals said to do) would make my horse move. So, I slowly trotted and walked my way down the gorge. Either way, it was a great experience. After about an hour, our guide suggested we stop at a museum. We weren’t sure what to expect and when we went inside, we couldn’t believe our eyes. The 6 of us slowly started to giggle, then laugh, and then seriously crack up, before crying with laughter! This was an animal museum and the taxidermist who stuffed these animals must have been high or something when he tried to bring them back to life and on display. They looked absolutely ridiculous. The Snow Leopard and the goat are two of our personal favourites. Once we were done rolling with laughter, we made our way to our ger camp for the night. This camp was the best one yet. Set on the rolling steppe hills sat 4 gers. Two for our group, one for the kitchen and one for another family. We were told that wolves roam the area, but unfortunately we didn’t get to see any. Our home for the night…not a bad view! We all played some cards, had our usual vodka shots and turned in for the night. We needed our rest for the final 3 days of our Gobi Desert trip! 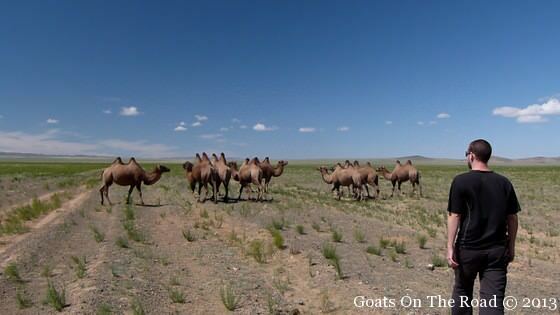 Check Out Our Gobi Desert Tour Video! 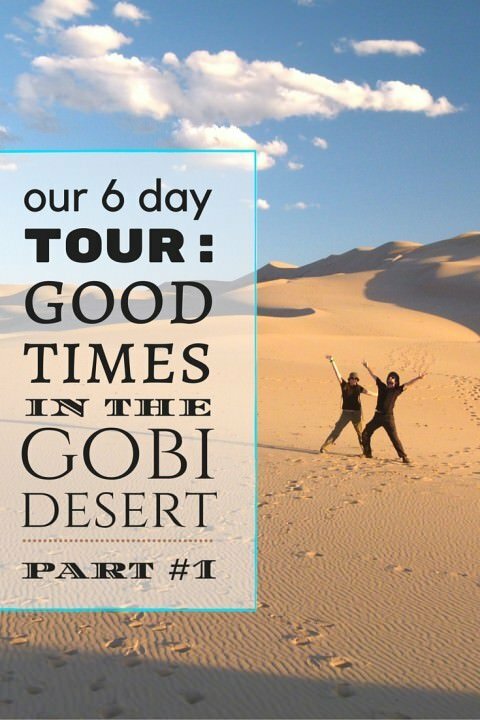 Stay tuned for part #2 of Good Times In The Gobi Desert and part II of this Video! This is such a trip. 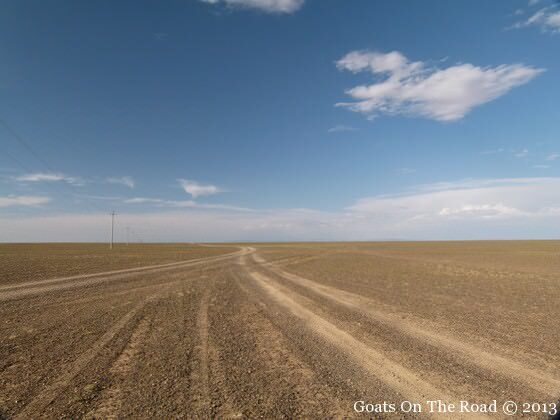 I cannot wait to see the Gobi for myself. 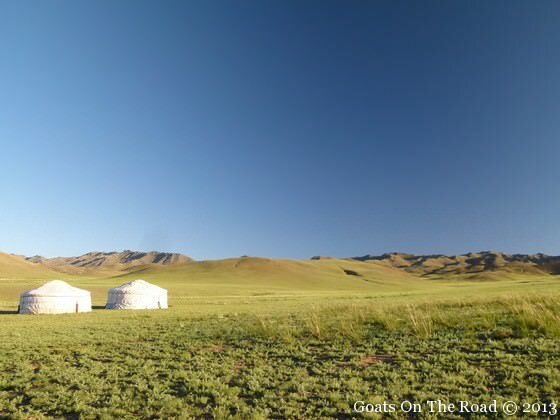 Mongolia is our first stop on our RTW trip. Glad to know what to expect for the toilet situation…fun times. 😛 But the rest looks amazing. 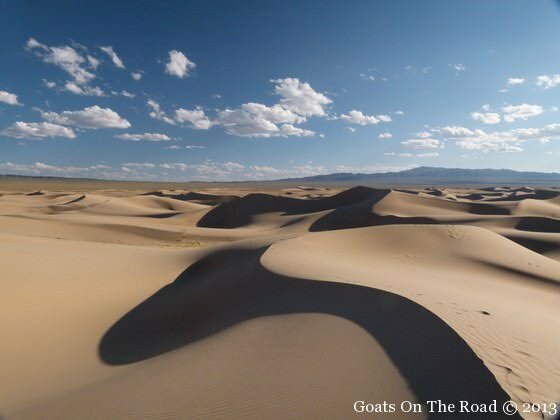 Those dunes…. Oh ya, those toilets are something else! 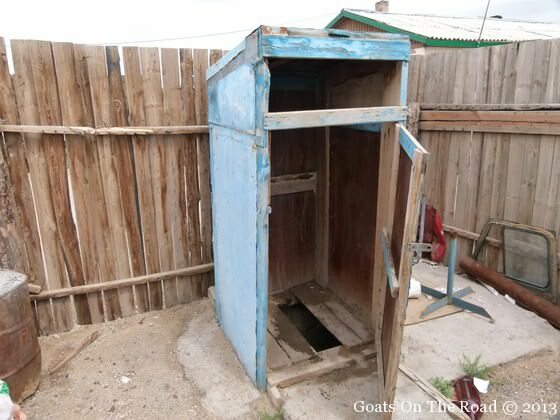 All around Mongolia you will find those out-house type toilets. The dunes were beautiful. Enjoy your trip to Mongolia, let us know if you have any questions. Those taxidermied animals are quite horrifying! The scenery reminds me a little of the southwest of Bolivia…but no camels there! Gandalf looks like great fun to travel with. Looking forward to more of ‘his’ antics! haha, it was hilarious. Gandalf was a great travel companion, he even drank with us and played cards. 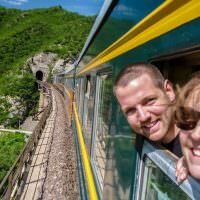 Bolivia is on our list of places to go! Thanks Casey! Aren’t deserts amazing? The Sahara would be an awesome place to spend some time. Okay, so I almost died when I saw those animals! And I’m currently on a flight, sitting in between two sleeping people I have never met, and had to use every bit of energy so as not to disturb them. Tears were literally streaming down my face. Thank you!! Hahaha. 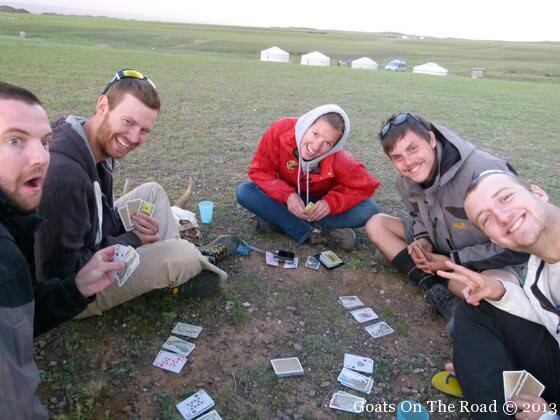 Anyway, so glad to see you guys out and about in Mongolia! Can’t wait to join you on the road! Cheers! hahaha, glad you appreciated the stuffed animals as much as we did! We were crying laughing when we were there. Hysterical. That’s so exciting that you’re heading off on your own adventure 🙂 Enjoy your trip! Sounds like you guys are back to the life you love! OMG I was giggling with you looking at the stuffed animals, hilarious! Not sure about the fermented milk, camel or otherwise. I have never encouraged u to drink but if it keeps u from bacteria based disease drink on! Love you both and miss you always! We’ve just completed our Gobi your with Sunpath as well. Hated those long bumpy car journeys but the scenery makes any gripe worthwhile. Never been wowed by a country’s landscape so much before – a nightmare for editing your photos later on. The Tsagaan Tsuvraga was our favourite. Totally agree – the long bumpy drives are pretty brutal, but there’s no other way to see this vast landscape 🙂 It’s such an incredible place. Glad to hear you enjoyed it as much as we did!